Anna von Mertens, "Gold! Gold! Gold from the American River!" 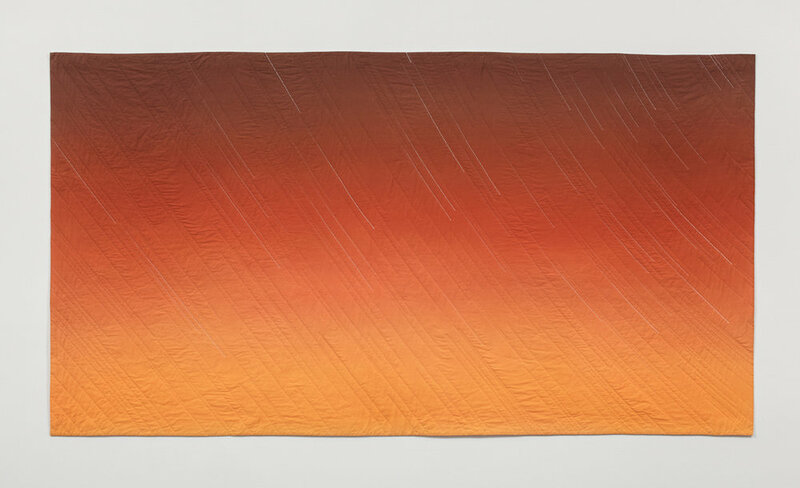 (Sunset, January 24, 1848, Sutter's Mill, Coloma, California), 2008, hand-dyed, hand-stitched cotton, 54 x 100 in. Image courtesy of the artist. Anna Von Mertens’s conceptual practice takes a subtle approach to politics, often taking as her subject matter natural phenomena or the cosmos. Von Mertens started her career as a painter and printmaker, before focusing on textiles. Her quilts depart from a status of craft to a conceptual medium capable of speaking a language of science and artistic research. In Von Merten’s practice, the quilts become abstractions of political moments in time, depicting natural, indirect abstractions of time such as star formations or the rings of tree trunks. Anna Von Mertens has had numerous solo exhibitions throughout the United States including the Radcliffe Institute, Ithaca College, Berkeley Art Museum;Boston Center for the Arts; University Art Museum, UC Santa Barbara; Crisp-Ellert Art Museum, Flagler College; Mills College Art Museum; University Art Museum, Cal State Long Beach. Group exhibitions include Making Historiesat the Kansas City Art Institute’s Artspace; Needle’s Eye at KODE, Art Museums of Bergen, Norway, which traveled to the National Museum of Art, Architecture and Design, Oslo, Norway; Uncontainable Portraits at the Museum of Fine Arts, Boston; a 2012 commissioned work for Ballroom Marfa; Aspen Art Museum; The 2012 DeCordova Biennial; and the 40th anniversary exhibition at theSmithsonian American Art Museum’s Renwick Gallery. Von Mertens is the recipient of a 2010 United States Artists Fellowship in Visual Arts and a 2007 Louis Comfort Tiffany Foundation Biennial Award. Anna Von Mertens received her BA from Brown University and her MFA from California College of the Arts. She lives and works in Peterborough, New Hampshire. Von Mertens’ work "Gold! Gold! Gold from the American River!" (Sunset, January 24, 1848, Sutter's Mill, Coloma, California) (2008) will be installed in the Storehouse at the English Camp.